Soft Pretzel is iconic in Pennsylvania. It even has its own holiday, National Pretzel Day, April 26. After the bagel endeavor, it’s now time to make Pretzels! I went fancy with the very first attempt. Well, they were a bit too fat, and turned into knots, LOL! Combine the water, sugar and yeast. Allow to sit for 5 minutes or until the mixture begins to foam. Pour into flour and add butter and, using the dough hook attachment, mix on low speed until well combined. Change to medium speed and knead until the dough is smooth and pulls away from the side of the bowl, approximately 4 to 5 minutes. Remove the dough from the bowl, clean the bowl and then oil it well with vegetable oil. Return the dough to the bowl, cover with plastic wrap and sit in a warm place for approximately 50 to 55 minutes or until the dough has doubled in size. Bring the 8 cups of water to a boil and add the baking soda. Keep water to a rolling boil. Preheat over to 425 and bake till golden brown, about 18-20 minutes. Cut bacon into bits, roll bacon and shredded cheese into the dough. 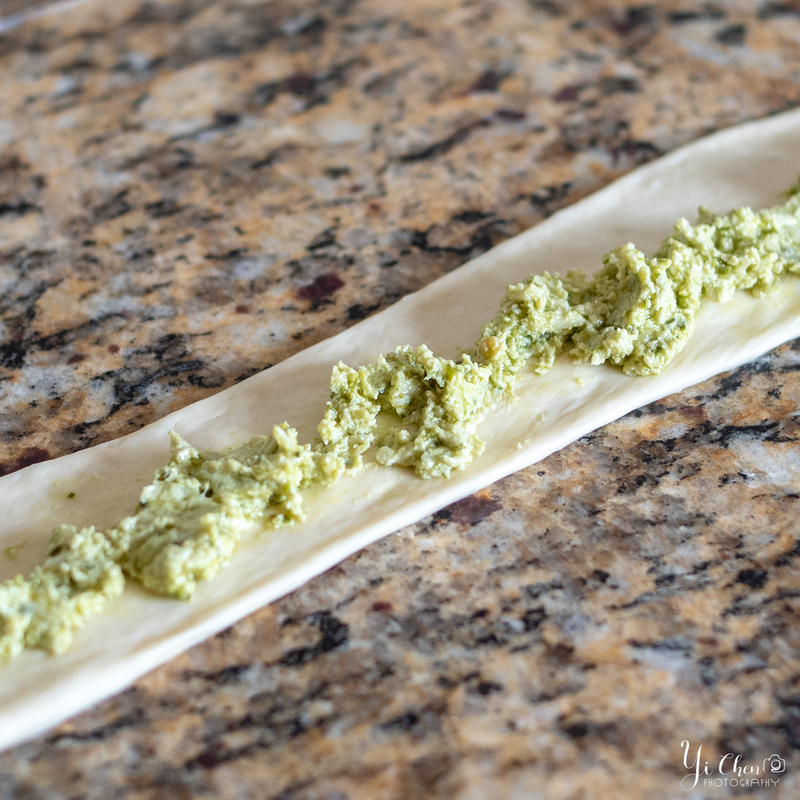 Roll Italian herb, Thymes, etc and shredded cheese into the dough. Dice sun-dried tomatoes and Swiss cheese into small pieces, knead into the dough. Mix crab meat with cream cheese, Worcestershire sauce, spring onion and garlic. Roll dough out to rectangular piece, place 2 tablespoonful of the filling in the center, roll into log lengthwise, close both ends tightly. Add 1/2 tbsp of honey, 1 tbsp of Sriracha into the dough, add some flour if necessary so that the dough is not sticky. Mix diced ham, cheddar cheese and cream cheese. Roll dough out to rectangular piece, place 2 tablespoonful of the filling in the center, roll into log lengthwise, close both ends tightly. Mix pesto, grated Parmesan cheese and cream cheese. Roll dough out to rectangular piece, place 2 tablespoonful of the filling in the center, roll into log lengthwise, close both ends tightly. Dice apple into small pieces and toss in brown sugar and cinnamon, roll into doll before rising. Roll out dough into rectangular piece, place cranberry in the center and roll into a log lengthwise. Brush on egg wash, then sprinkle appropriate toppings: pink salt for savory pretzels, cinnamon sugar for Apple Pretzel, etc. Bring 8 cups of water to a boil and add 1/2 cup of baking soda. Boil pretzels in the water for 40 seconds, turn half way. Bake at 425F for 18 minutes.